Miriam O'Callaghan hosting a filthy gameshow? A Ray Darcy-style Mass? A 1916 musical tribute from Michael Flatley complete with guns? 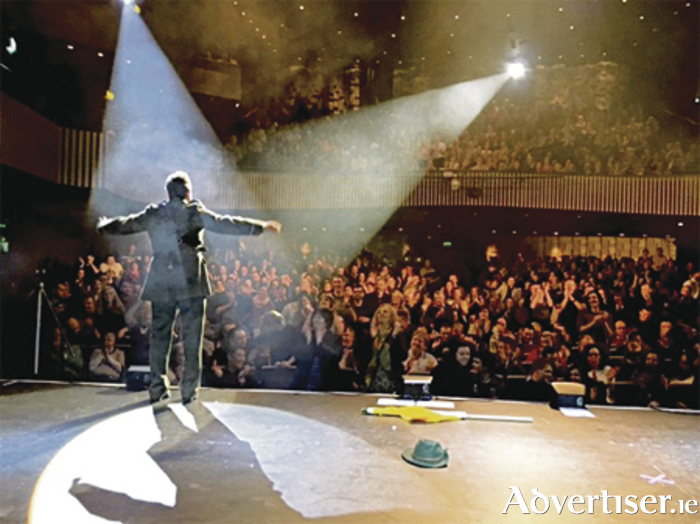 It could all only mean one thing really - Mario Rosenstock is all set to return to Athlone for the opening night of his brand new tour. Rosenstock returns to the Radisson Blu Hotel on November 11 with an updated, side-splitting agenda of satirical characters and hilarious sketches sure to leave you in stitches. 2016 has been a year like no other both at home and abroad, and as a result Rosenstock descends on Athlone with a rich armoury of new characters to complement all of your old favourites. "The reason we are doing this tour is because 2016 has been completely nuts," Mario says. "I am on stage in Athlone on November 11, and two days later the American presidential election takes place – so I'll be bringing Trump all over the gaff – he’s going to be talking about building walls all around Athlone and getting the people of Westmeath, Ballinasloe, and Galway to pay for them. "This year we had Apple, Brexit, the Olympics 'stuff', the Government is all a bit finicky and we have no idea what will be happening there by November. We have had new characters like Shane Ross and, of course, Danny Healy Ray - it’s just going to be a jam-packed show and I cannot wait for it now." During the course of the last 15-odd years Mario has risen to the pinnacle of the Irish entertainment scene. But despite his glaringly obvious gift of performing and amusing audiences, even Mario needed a certain amount of luck in the beginning. "I was auditioning for serious roles but what I was finding was that I was being cast in comedy roles," he says. "Sometimes I would go into an audition for a serious character and they would end up breaking their balls laughing. I’d be like, ‘I was trying to be serious there’! So I was being funny a little bit inadvertently, but that was aside from my facilities with voices. "I was living with two girls from New Zealand in a flat in Monkstown. One of the girls was a producer who was in the process of travelling the world. She got a part-time job in Dublin with a fledgling station called Radio Ireland (later Today FM ). We got to know each other quite well – they minded me, because it was the first time I moved out of my mammy’s house. "One of the girls used to hear me every day going around the apartment doing voices. She would be walking by the bathroom and hear something like Gerry Adams washing Martin McGuinness in the shower. She would hear - ‘Oh Martin do you want some more shampoo there’ – ‘Oh right so Gerry, rub it on there'. "I’d be making a sandwich in the kitchen as Bertie Ahern and things like that. I was just having a bit of craic. The girls would say - ‘Mario, do you realise you are talking to yourself there?'. But one day they asked me if I’d ring the station as one of the characters, and I rang in as Gerry Adams. He insisted on hearing a Boyzone song but then denied emphatically that he was a Boyzone fan. "That was the first time I was ever on the radio, but around a year later Ian Dempsey came to the station. He had heard some of the skits I had done and so we had a meeting which went really well and we started trialing stuff on the radio straight away. That was really the beginning of what we all now know as Gift Grub." Mario's great gift is his ability to appeal to people of all ages, something that he is very conscious of: "I love the idea of The Simpsons being able to communicate simultaneously with people of 38 and 39 and children of eight and nine," he says. "A lot of kids love Gift Grub because they love the sounds and the voices and dramatic nature of the characters, without necessarily understanding what the characters are on about. The kids would understand something like Paschal Donohoe being the best boy in the class and licking up to the teacher, whereas the adults would understand that dynamic from a political point of view as well." And why pick Athlone for the opening night of his tour? "I was in Athlone last March, in the Radisson Blu Hotel, and it was absolutely packed," Mario says. "It’s a great venue and the Athlone audience is great as well, so I really can't wait to get back there." Mario Rosenstock plays the Radisson Blu Hotel on Friday, November 11. Tickets can be purchased from Ticketmaster outlets nationwide. Call (0818 ) 719300 or book tickets online at www.ticketmaster.ie Tickets can also be purchased at venue box offices. For further information call the Radisson Blu Hotel on (090 ) 6442600.